USA Today - After fouling off a pair of pitches and deftly laying off a curveball in the dirt, Tebow – with fans clad in his jersey from the University of Florida, the Denver Broncos and even freshly purchased Fireflies Tebow T-shirts – created his first bit of baseball lore, bouncing the ball over the left-center field wall, pausing before an umpire signaled home run, and then pumping his arms in exultation. It was an electric moment on a night that saw curiosity give way to reality. For the first time, the 2007 Heisman Trophy winner’s name was written into a regular season baseball lineup, which meant somebody else’s was not. It meant that the thousands of fans here didn’t just have to root for anonymous minor league laundry - rather, they could pay $25 for the Tim Tebow Columbia Fireflies T-shirt jersey. The shot heard around the world, the sporting world at least as Tim Tebow hit a home run in his first official minor league at bat. I can't make it up even if I wanted to. The guy who was a Heisman winner and starting QB in the NFL, is hitting homers in the minors. Of course, ask any red-blooded American and they'll say, "if anyone could do it, it's Tim Tebow". That is just crazy to me. The infatuation the media and people have with this guy is ridiculous. Listen, I'm not a Tebow hater, I just think maybe we forget about him for a while until he becomes a .250-300 avg. hitter with some consistent power. We won't though, nope, it's just like when MJ went to the minors. Everyone needs to know how every game went, what did he eat, who did he talk to after the game. It's a circus and the Tebow traveling circus has been in full swing since 2006. I mean, I expect nothing less of a miracle every time Tebow comes to the plate because he is the son of GOD loving people. He has faith in himself every time he comes to the plate, which is great thats exactly what you want in your players. I just wonder how much of it his teammates will be able to handle moving forward. These guys haven't been taught how to deal with the media. They're a bunch of 18-23 year olds who are still developing their games and just trying to make it to Double-A in the next two years. Tebow, will be there for at least 2 years, because the Mets will try and ride the cash cow for as long as they can bear it. They may even bump him up to Double-A just to make more merchandise, because why not? 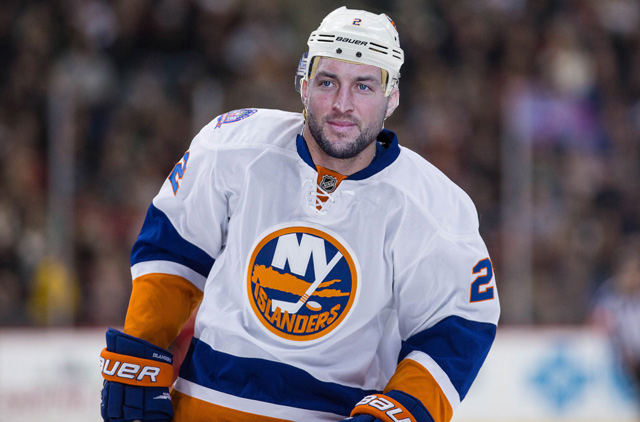 No one knows where the Tebow train will go, but if I'm the NHL I start getting ready because he's already done football and baseball, the next logical sport is hockey.